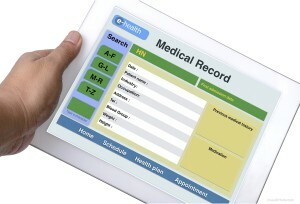 Among the improvements in healthcare, EHR or Electronic Health Records has the potential to become a real game changer. Potential is a well-chosen word because the technology, although not exactly new, is still being improved. Technology has enabled physicians, pharmacists, and other professionals to participate jointly in patient care. Wikipedia defines EHR as the “systemized collection of patient and population electronically-stored health information in a digital format.” In short, the revolutionary use of technology to record data and to assimilate records that cover large time spans is affecting everything from the way doctors collect and store your blood pressure data to the way it is entered into your records and the way you are billed for the procedure. What are Some of the Benefits of EHRs? For one thing, the digital records are easier to read than handwritten paper records. Another positive is that the data can be shared across networks and between professionals. If you have to see a doctor while you are away from your primary care physician, the new doctor will have access to your records without having the inconvenience or time delay of having them sent, or of making phone calls. The EHRs have made the use of standardized forms easier as well. The fact that there is only one document which is accessed and updated by everyone who sees you medically means more continuity of care and that the collected data will be more complete. Health professionals will update the blood pressure data, for instance, each time you are seen, which gives doctors a history of your data. If you have been given medications to control the pressure, doctors will be able to assess the long term effects. Medical equipment like x-ray machines and vital-signs monitors, as well as electrocardiographs and other machines, enter the data as soon as it is collected which reduces the possibility it might be missed in manual dictation. In addition, because the report is one document, doctors can see reports and data that have already been entered and that reduces the repetition of information. Billing takes less time, and that decreases costs across the board. The government is so certain that EHRs are beneficial for Medicaid and Medicare programs they provided incentives to doctors and healthcare professionals who implemented the technology. There is a downside. The potential for security breaches in the system have not been eliminated, so your data could be “hacked” by criminals to get financial data stored on your records. In addition, a 2014 study by the American College of Physicians found that family doctors spent more time each day entering data; 64 percent said that writing personal notes into the system took longer and a third of doctors studied said it took longer to find other doctor’s notes in the record and to read them. An article on the Physician’s Practice.com website referred to the advances in accessing the EHR from handheld devices like tablets and cell phones and said that the data was unreliable. The “bugs” have not all been worked out of the system. The technology is still in its childhood, and there is a lot of room for improvement and growth. Still, Electronic Health Records have the potential to reduce healthcare mistakes and make it more affordable as more practitioners and facilities adopt them. See also: What is Medical Informatics?